Card Drive for the SPCA! The Paperie is having a Card Drive! Here is your opportunity to do something you love and give back to your community at the same time! Create 5 (or more) handmade cards for any occasion, bring them into us at The Paperie, and we will donate them to the local SPCA Spring Sale on April 17th. The cards can be all the same or all different – you choose the cards, we (at The Paperie) will package them up for you, and send them off to the SPCA sale! 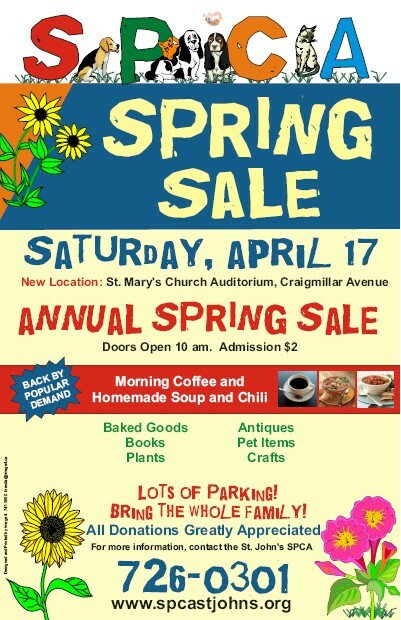 Don’t forget to pop by St. Mary’s Church Auditorium on April 17th to support this special organization if you’re in the area! Thanks for sharing! If I can get organized, I’ll definitely participate for such a great cause! I will try my best to get this one done too Megan! What a great cause! Thanks for making the animal world a better place. Sorry Megan I guess I read the date wrong! But if this extended please email me and I can send off some cards too you. And what a better place than my old stampin grounds. I so miss home! Lol! Off to google and see if I can find out more about your store.